Three by J.A. 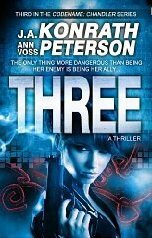 Konrath and Ann Voss Peterson is the third book in the Codename: Chandler series. As such, it carries on the action about a week after the events of the previous novel, Spree. In this instalment, the three remaining sisters, Chandler, Fleming and Hammett must work together to avoid being captured or killed by government agents, avoid assassins sent by The Instructor, avoid killing each other, and depose a power mad President, set on controlling the world at any cost! Now, while all of that sounds pretty far fetched, there’s no denying that it makes for a damn good action packed roller coaster of a thriller. While the action came fast and furious in the previous two novels, for the most part, everything seems to happen at a more sedate pace in this book. There are lots of characters, and, like the other books in the series, each chapter focuses on one of them to progress the story. This is a neat approach as it keeps the story fresh, and offers different perspectives. Despite this being the third book in a series, the authors have included enough information for it to be read as a standalone book. This may be quite frustrating to a fan of the series, as it not only makes the book longer than necessary, but also goes over old ground. I didn’t find it too annoying, although some chapters did seem superfluous, and it did slow down the pace.